If you’re planning on remodeling or making improvements to your home, you’ll need to review your homeowner’s insurance policy first. Being covered is the metaphorical foundation of any home renovation project. This includes do-it-yourself projects, too. There are a few more steps you should take to ensure a safe and professional remodeling project. As the homeowner, one of the most important things you can do is talk to your insurance agent. Your agent can provide valuable advice, assess any risks you may have overlooked, and recommend any additional insurance you may need. According to Insurance Journal, it also makes sense to incrementally increase your insurance limits as the project progresses. If you operate a business out of your home, you may want to consider adding an in-home business policy, renter’s insurance, or add-on to your existing homeowner’s policy throughout the renovation process. After you’ve found a general contractor you like, make sure he or she is licensed and holds a surety bond before signing any sort of contract. The surety bond covers any financial losses you may incur if they don’t finish the job. Make sure your contractor has obtained all the necessary permits, and agrees that all work performed will be done according to current building codes. The contractor’s general liability and workers’ compensation insurance is responsible for property damage, job site injuries, and negligence in workmanship. But their policy only covers damage to your existing property, not to the new work being performed. You should also confirm that your subcontractors are either insured through your general contractor or have their own workers’ compensation coverage, because you don’t want to be held liable for any injuries occurring on your property. It’s also acceptable to vet workers for criminal history, if you choose to. Property theft can be a problem during big renovations, when multiple strangers are walking in and out of your home. Stick as close to your original budget as possible. Stay organized: Keep copies of every contract and receipt. Take photos of the renovation before, during, and after for a visual record of the work. It’s done! Time to relax? Nope, but you’re so close. Now that you’ve completed your renovations, check back in with your insurance agent to make sure all the upgrades are reflected in your coverage. 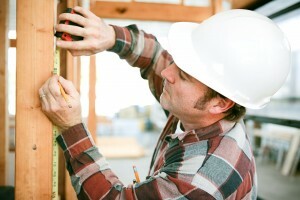 You may get a discount if your repairs involved eco-friendly upgrades, a new roof, or updated electrical or plumbing. But on the flipside, your rates might go up if you installed a swimming pool or an addition to the house. After all that’s finished, you can sit back, relax, and enjoy the fruits of all that remodeling. Are you thinking of renovating? Finally modernizing that kitchen? We’re always here to answer your questions and concerns. We also invite you to connect with us on Twitter and Facebook. Happy remodeling!